Have you ever gotten the feeling God is trying to tell you something? Receiving positive reinforcement is sort of a Catch-22 situation for me. On the one hand, I really feed off of it. In fact, I borderline crave it. On the other hand, though, I have a tendency to either not believe people when they say nice things to me or I downplay whatever point they’re trying to make. It’s an odd state of limbo to live in, I’ll admit, longing desperately for something you’re not even entirely sure is genuine when you do get it. One of my primary weapons of choice for making sure I never feel too good about myself is self-deprecation. Now, in the proper hands, self-deprecation can be really, really funny. 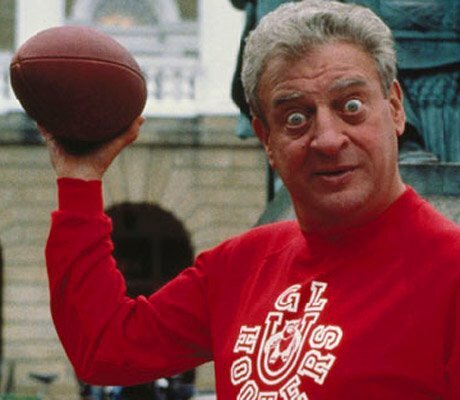 Just look at Rodney Dangerfield. I’d like to think I wield it in the same way – as a tool for humor and relating better to those around me. Recent events, however, have led me to believe I might need to tone down the act a bit, so to speak. Two different people yesterday told me I need to stop speaking so negatively about myself, and then another person told me the same thing today. The irony of this is that I actually thought I was doing better. If they think I’m bad now, they should have seen my in my twenties. Actually, on second thought, I’m glad they didn’t know me back then. They might have committed me to some kind of institution or something. At any rate, it seems an unusual amount of people are coming across my path these days and telling me to lighten up on myself. Telling me I’m not such a bad guy. Trying to convince me the things I perceive as negative about myself are actually not any worse than the struggles most people wrestle with every day. I should be hoarding all this away, putting it all into some sort of self-esteem piggy bank in my soul. Instead of just accepting it, though, I seem strangely intent on batting it all down. Backtracking to the question I began this entry with, yes, I do believe God may be trying to tell me something through all this. In fact, I can probably even pinpoint exactly what that something is. I’m fighting it, though. Fighting it every step of the way. Of course, in the maze that depression creates in the mind, I know I shouldn’t be. People probably aren’t noticing half the things I don’t like about myself anyway. I know they’re there, though, and that’s what makes believing the good things people say about me so difficult.